3 . STM32 with 12 -bit analog-digital ( AD ) converters , can achieve 10 Road, analog input. Onboard there are 8 -bit independent digital-analog module ( ADDA ), to achieve 4 analog inputs 1 analog output. 4 . STM32 with 2 hard- I2C bus and two hard- SPI bus , not a software simulation, high speed stability, and can be easily developed in this board experiment. 5 . 5 -axis stepper driver module , you can simulate intelligent robot and CNC systems, the software algorithm by linear interpolation, circular interpolation and so on. 6 . full-page modular design , flexible combination of functions, high degree of freedom, to leave room to learn and use. 7 . industrial sector with the RS485 communication module , the output required by industry standards designed to facilitate access to any RS485 device composed of multi-machine interconnected to form the 485 network systems (two if you have this board, only two lines, two machines can be communication). 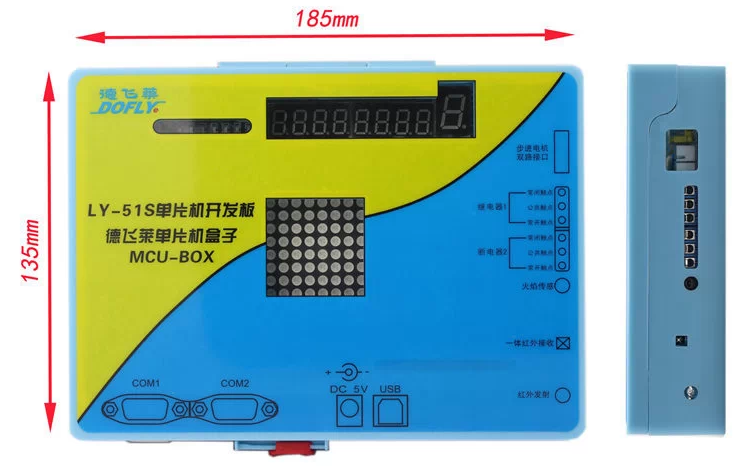 8 . pulse generator module , the 555 components of the pulse generator can generate adjustable frequency square wave, to give H -bridge circuit to provide pulse source. 9 Dual independent serial port module , onboard the 2 serial ports, dual serial ports for the microcontroller. STM32 it has three serial ports, dual serial port can learn. 16. automatically download the module for STC of 51 single-chip design. 17. support ucOS II real-time operating system migration , and is equipped with portable routines. 18 China's first with an industrial configuration software , you can quickly achieve the kinds of monitoring systems. Increase your learning directly to the application. 19 . resources are too rich and some other boards, we all have, a different one.